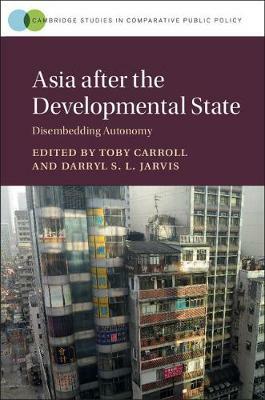 Author(s) Carroll, Toby; Jarvis, Darryl S. L.
Asia after the Developmental State presents cutting-edge analyses of state-society transformation in Asia under globalisation. The volume incorporates a variety of political economy and public policy oriented positions, and collectively explores the uneven evolution of new public management and neoliberal agendas aimed at reordering state and society around market rationality. Taken together, the contributions explore the emergence of marketisation across Asia, including China, Japan, South Korea, Indonesia, Malaysia and Vietnam - what is now often described as the world's most economically dynamic region - and the degree to which marketisation has taken root, in what forms, and how this is impacting state, society and market relationships.